Truth be told, I have come to the belief that I am just an idealistic person -- my ideas though, remain as ideas. For many years now, I have had tons of opportunities and chances to execute this seemingly 'bright' ideas. But as instances would have it, I have never gotten over the inertia. When Bam invited us to the Why not a ReimagiNATION? Forum at the Ayala Museum, I had no idea that such forum would give me the insights I was looking for. Paco Sandejas, Ph.D. is the Managing Partner of NarraVC. He also serves as the Managing Director of Brain Gain Network Ventures, a Philippine-based management and consulting company focused on technology ventures in the same space as NarraVC. 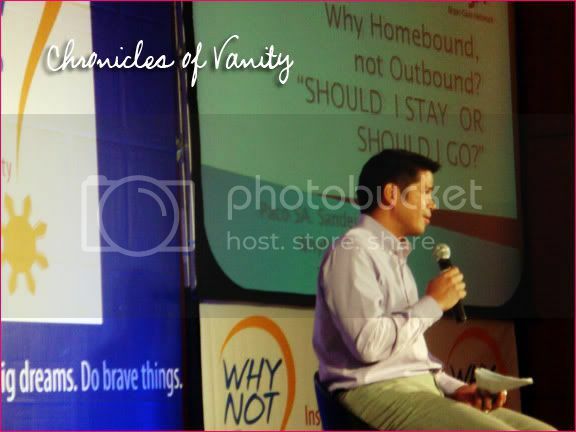 His topic, "Homebound or Outbound?" is the topic I enjoyed the most. You see, I have the same dilemma. I've long been offerred to study my Masters in the US, in one of Boston's prestigious universities. My mom have always been a staunch supporter of global education and one time, before she left to back to the US, she bought me all these review guides for TOEFL and other exams I needed to take to be able to go study. To this day, all these materials are gathering dust in my bookshelf back in Quezon City. I simply cannot bear to leave the Philippines, in all its smog-infested, corrupted glory. How does this relate to me? Initially, I thought that Paco will be telling us that it's a sin to leave the country -- but he did not. He presented his case: The world is a borderless world. If you want to be the best, then you have to compete with the best in the world. How does one do this? If one has the option and the chance to go tudy overseas, grab the chance, Paco says. The world lets you mingle, debate and all that when you are out there. After you get premium education, what do you do? Paco told his story. After his masteral and doctorate studies at Stanford University, he proceeded to work at the Silicon Valley. He picked up the best practices and the knowledge and then he was homebound --- to start a business and eventually helped more Filipinos. It was amazing how his experiences inspired me. For years now, I've been thinking that loyalty to the country meant staying here -- but such is not always the case. Soon, when I've got my acts together, I will get all the exams done, get my MA [and a Ph.D, I hope!] in Boston, I will fly back to the Philippines and make the country a better place in my own way.